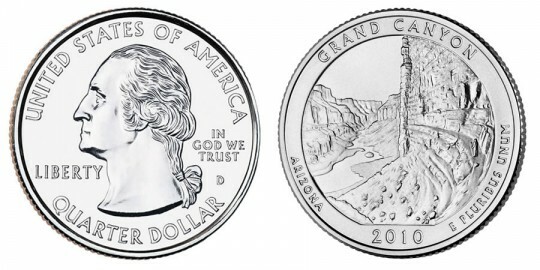 In the second half of 2010, the US Mint will be issuing the fourth coin in the America the Beautiful Quarter series known as the 2010 Grand Canyon National Park Quarter. 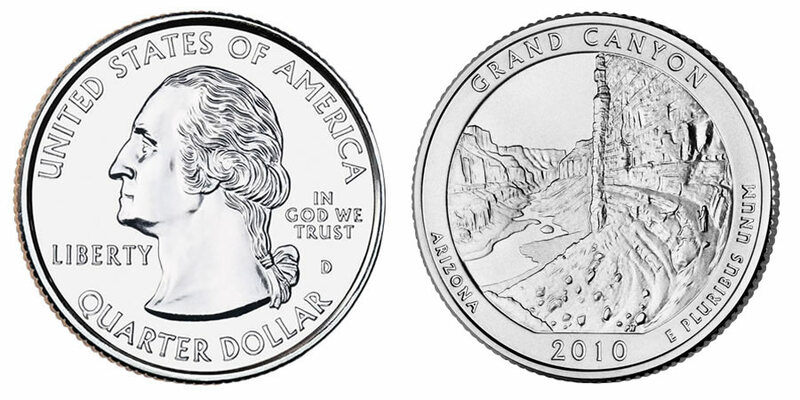 Representing what many consider to be one of the world's national wonders, the Grand Canyon quarter follows coins honoring three other national parks; Hot Springs, Yellowstone and Yosemite. Located in Arizona, the Grand Canyon is said to have been cut over thousands of years with the erosive powers of the Colorado River found at its base. The canyon is listed at 277 miles long with a width ranging from four miles to eighteen miles at a depth of up to one mile. The park itself covers over 1900 square miles. George Washington is featured on the obverse of the quarter with a portrait designed by John Flanagan. The inscriptions "UNITED STATES OF AMERICA," "QUARTER DOLLAR," "LIBERTY", "IN GOD WE TRUST" and the mintmark will also be placed on the obverse. An image of the walls of the Grand Canyon and the Colorado River winding through them is shown on the reverse. It was designed and sculpted by Phebe Hemphill. Also shown are the inscriptions "GRAND CANYON," "ARIZONA," "2010" and "E PLURIBUS UNUM".